In this post we will be doing a few problems on Gauss-Elimination. These problems/exercises were given in my Numerical Analysis class. 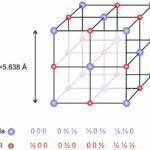 These will help in polishing one’s skills in solving different kind of systems, and working with different kinds of matrices, and in the process bring out some inherent problems/intricacies with the Gaussian Elimination procedure. Notice how the results change when you change the precision from float to double. There are two options to do this in C.
1. 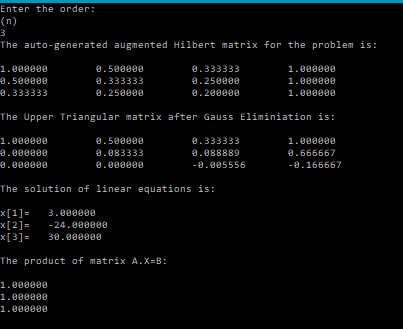 Pass the augmented matrix (a) as the parameter, and calculate and store the upperTriangular(Gauss-Eliminated Matrix) in it. 2. Use malloc and make the function of pointer type and return the pointer. This program uses the first option. 1. Pass a matrix (prod) as the parameter, and calculate and store the product in it. 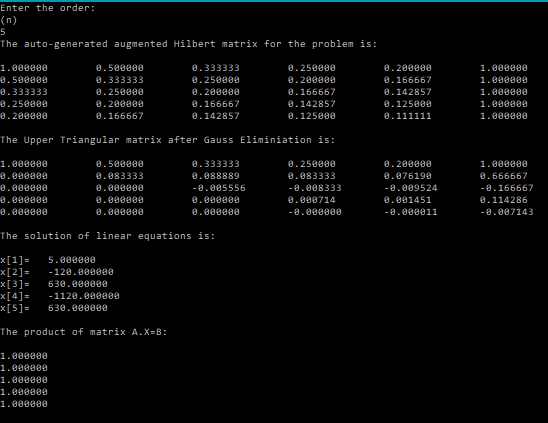 //Now we will verify if the answer is correct by multiplying X (solution) with the Hilbert matrix and see if we get 1. I’ve also created a few Android apps that perform various matrix operations and can come in handy to those taking a course on Numerical Methods.